Cementitious urethane flooring companies claim they deliver critical industrial and heat resistance when applied to high-traffic and high-contamination areas. 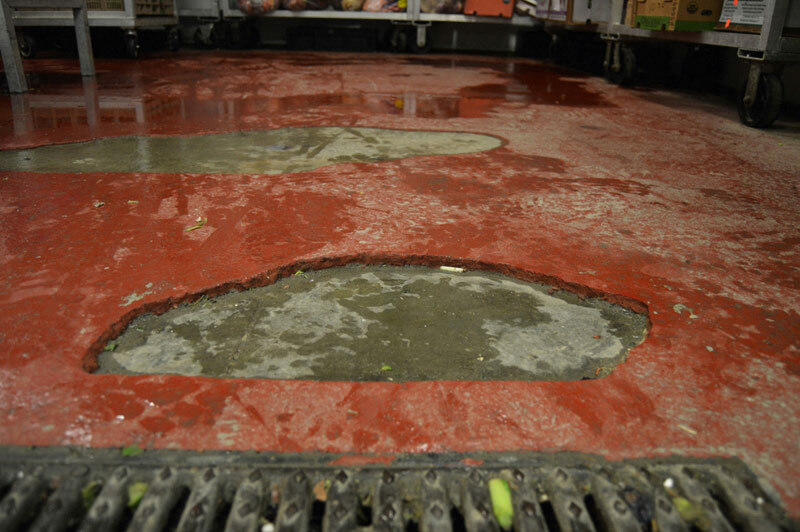 Manufacturers will often tell buyers that this is an ideal floor for commercial foodservice establishments. Cementitious urethane flooring is concrete-plain and simple. The difference between cementitious urethane and everyday concrete is cementitious urethane is a little harder and reinforced with urethane, but it’s still porous. And because it’s porous, it can easily harbor bacteria and is prone to deterioration when saturated. To make its non-porous and seamless claims, there needs to be a top-coat on it. But because cementitious urethane flooring is concrete, this topcoat is really the only floor. Some installers put the top-coat straight on the concrete but, at the end of the day, cementitious urethane is more or less equal to applying a coat of paint. Cementitious urethane used as flooring is also NOT healthy. Because the cementitious urethane is a form of concrete, it is prone to pinholes and condensation. Tiny pockets of moisture could be retained during the curing process, retaining microbes and debris that will shorten the concrete topping’s lifespan. The inevitable cracks on the surface and the unsanitary conditions will become, ultimately, become a costly and time-consuming issue. Everlast® Epoxy Floor is resin-rich throughout the system, so penetration is never a concern. Our floors hold up particularly well in consistently wet areas, unlike cementitious urethane. And to support that, Everlast® Floor is made with an EPA registered Anti-Microbial additive to restrict the growth of microorganisms. Put it all together and it’s easy to see why Everlast® Floors meet commercial kitchen, laboratory and cleanroom hygiene requirements, while looking and feeling great. With dozens of colors and a durable, attractive and easy to clean surface, you’ll always have the look you crave and the chemical-resistance you need.